June 30: Anthony Ervin and Hyleas Fountain are working hard to make it to London. Anthony Ervin attempts an Olympic comeback in the 50m freestyle at the U.S. Olympic trials. The event: Swimming: women's 200m back (semifinal); women's 200m breast, 200m IM (final); men's 100m fly, 50m free (semifinals) and men's 200m back, 200m IM (finals). When: 6.30 p.m. to 8 p.m. ET, NBC Sports Network and 8 p.m. to 9 p.m. ET, June 30, NBC. 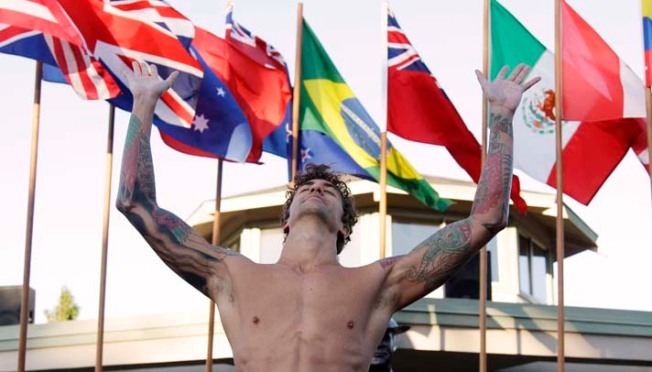 One to watch: Anthony Ervin will not be hard to miss when he competes in today's 50m freestyle: the 31-year-old has sleeve-tattoos covering both arms. Ervin was the first swimmer of African-American heritage to make the U.S. Olympic team and at the 2000 Sydney Games he won gold in the 50m free and silver in the 4x100m freestyle relay. Three years later he shocked the swimming world by retiring before he could get a chance to defend his medal at the 2004 Games. Raised in Valencia, Calif., Ervin's father is of African-American and Native American descent and his mother is Jewish. At the time of his retirement - at the ripe old age of 22 - Ervin told the Daily Californian that he felt "like that part of my life - as a competitor - is over. I'm moving on to new things, new goals, new ambitions." Those new ambitions included a move to New York where he played with a rock band and taught swimming to children. He moved to the Bay Area in 2010 and cites those children he taught in New York, and those he met later at a club in Oakland, as the inspiration he needed to get back into the pool competitively. "Seeing them committed, gradually making changes and improving, and then having fun with it, I don't know," Ervin told The New York Times. "I guess it kind of blew on some embers that had grown really, really cold, and eventually grew into a fire." The event: Track & Field: men's 200m (semifinals), men's 110m hurdles (final) and women's 800m heptathlon, women's 200m (finals). When: 9 p.m. to 10 p.m. ET, June 30, NBC. One to watch: The women's heptathlon consists of 100m hurdles, 200m dash, 800m run, long jump, high jump, shot put and the javelin throw. The term "all-around athlete" could not be more prevalent and versatility, rather than one major strength, is the key to winning. Fountain, 31, grew up in Harrisburg, Pa. but now resides and trains in Port Orange, Fla. Since Beijing, Fountain has battled numerous injuries including neck, back and hamstring concerns that have often sidelined her. "Since I haven't done much in the past couple of years because I have been injured, people are putting me on the back burner," Fountain told the Daytona Beach News-Journal last week. But the athlete is cool with the perception, saying that the lack of pressure is a good thing. But don't think Fountain isn't focused on that medal podium - both in Oregon and London. "Definitely this year, I'm coming back," she says. "I'm a lot stronger than I was before, so I'm definitely excited to go to London." What happens: The top three athletes in the women's heptathlon will qualify to make the Olympic team and journey to London. The event: Gymnastics: men's final. When: 4 p.m. to 6 p.m. ET, June 30, NBC. Ones to watch: Team U.S.A. has not won men's gymnastics' top prize since Paul Hamm took the all-around gold during the 2004 Athens Games. Danell Leyva is planning to change that this year. It's easy to see where his conviction and determination comes from: Leyva's stepfather and coach Yin Alvarez defected from Cuba while on a trip to Mexico in 1992. A year later, his mother spirited Danell and his older sister from Cuba to the United States via Peru and Venezuela. The two childhood friends (both former gymnasts) married in 2001 after a period working together in Florida. "For me, [thinking about the Olympics] pumps me up," Leyva, 20, told U.S.A. Gymnastics. " I picture myself there everyday, and I get excited. My dream is coming true. I'm really excited and can't wait for it." Leyva will be facing tough competition in the form of John Orozco, who took the national title this month in a surprise upset. Throughout the competition Orozco had not one a single event, but had steadily produced one solid routine after another. By delivering an almost faultless final floor exercise, Orozco beat Leyva by 0.05 of a point to claim the men's all-around title. The stage is now set for a friendly rivalry at the trials. There are six events in men's gymnastics - floor exercise, pommel horse, still rings, vault, parallel bars and horizontal bar. With only five spots on the Olympic team up for grabs, it'll be a test of all-around competence and strength for the men today. There may be no room for those who specialize in only one or two of the exercises.